Supervisor Katy Tang greets the crowd. Sean Kennedy, Muni Forward Program Manager, standing behind and to her right, gave the main presentation. 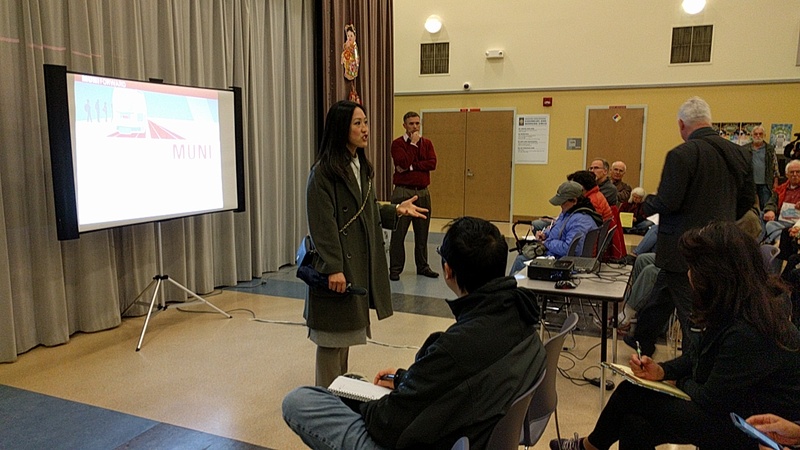 Over a hundred people braved the wind and rain yesterday evening to attend the latest public outreach meeting about SFMTA’s planned “Muni Forward” improvements to the L-Taraval streetcar line. 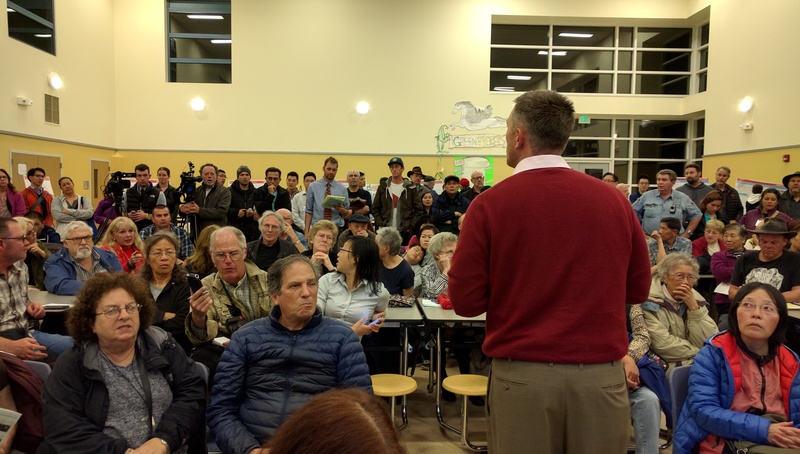 The meeting was held at Dianne Feinstein Elementary school, about two blocks south of Taraval. To reduce these collisions, the agency is looking at installing more concrete platforms in some places and improving markings and law enforcement in others. Kennedy explained that a common problem is too many motorists do not understand that it is illegal to pass a stopped train when it is loading and unloading passengers. “Around a third of motorists ignore state law, putting passengers in danger,” he said. Sean Kennedy, Muni Forward Program Manager, presents to a grumpy and unruly audience. The project includes general improvements, such as rail replacement and upgrades, to smooth out and quiet the ride. They will also paint the track area as red, transit-only lanes. Another complained that replacing parking around the corner was not good enough. “You’re still ruining it for those merchants!” Another man shouted that 22 people hit while alighting the trains “doesn’t seem like that many” and does not warrant making changes. Teri Lenfest, an Outer Parkside resident who held a cane, suggested Muni “take a hint from the railroads” and have grade-crossing barriers come down to block automobiles from endangering pedestrians. Kennedy suggested that would not work, as motorists would just go around them. I am not fooled by anyone, I have lived in the City for 30 years. You can shove your sacrifices. I pay the same fare as anyone else. Muni engages in geographic discrimination of outlying neighborhoods, basically. Ask folks near Park Merced what it’s like. I could care less about “compromise” projects when the service itself is awful, and has been declining steadily while costing more. Give me a break with compromise. Those of us in the outer neighborhoods have compromised as it is. The entire system turns its back on us and prioritizes other areas. Get a clue. Another man shouted that 22 people hit while alighting the trains “doesn’t seem like that many” and does not warrant making changes. Exactly how many people have to be driven over by motorists violating the law? 50? 100? Only once it’s someone you know? If one has mobility problems, an accessible with a stop with a ramp every 2-3 blocks would be an improvement over non-accessible stop on every block wouldn’t it? I totally agree and support safety zones as an immediate interim improvement. I live on Noe at Market where we have been clamoring for improvement, and the installation of safety zones has definitely improved the feel, reduced the honking, and I hope when the first year results are reported they’ll show they had an effect. How they work that the street is given a special coat of paint and barriers are placed around them to keep drivers out. The photo is one I took right before the plastic posts were added keeping drivers out of the beige area, the rendering shows what it would look like with planters. What the SFMTA is now pitching for Taraval is not a safety zone, it’s a traffic lane. I made a quick sketch of what Taraval would look like with safety zones (removing parking and moving through traffic to the side lanes) vs. the SFMTA to maintain the current conditions with a parking lane, a through traffic lane, and Muni Riders stepping out into oncoming traffic. It’s still not as ideal a full boarding platform, with a fully accessible ramp, but a safety zone free of car traffic would give riders some protection. If the SFMTA is going to paint a fancy pattern at L-Taraval stops, wouldn’t it be better they create safety zones that give riders protection? Muni, after too many years of crappy and unreliable service, is finally starting to improve service by increasing transit speed and reliability. The modest proposals for Taraval help the L meet this objective. We are a city and, like it or not, a community. Living with others always involves compromise. The SFMTA seems to really be doing its best to accommodate all views. It might be without a problem for the driver. If you’re a pedestrian or, especially, a wheelchair user, you’re often forced to walk or roll into the street to navigate around the parked cars on the sidewalk (as the name implies, it’s for walking). Or you might simply give up and drive, or stay home. Cars first San Francisco. I absolutely agree. However there are some streets in the city with 12-15 foot wide side-walks, as I mentioned, which allow a car to park without inconveniencing wheelchairs etc. Not saying it’s right. It isn’t. But if you have to do it, do it on one of those streets. Isn’t Muni undergrounded at Market and Noe? Never heard anyone say “We’re moving to Boston/DC/Philly/Chicago, guess we’ll have to get rid of a car.” What attributes of those cities make you feel that they are less car friendly than SF? Angled parking, with corner planted extensions were tried here in Duboce Triangle. I suspect some of the same arguments were made about Noe and Sanchez being too narrow for angle parking (especially with the fire station) but they were successful at calming traffic. ~40 years later our mature tree canopy is a distinguishing feature we’re quite proud of. After a few months, folks will get used to the new parking arrangements. Anyone who’s travelled downtown by car should be familiar with the plethora of confusing parking setups. Is that sarcastic? It’s easily one of the least car friendly cities in America. Driving across town takes an extraordinary amount of time, fines and meters are as high as anywhere on the planet, and parking was a nightmare even before the recent boom. From now on at community meetings, I think we should all start asking planning how they live with themselves knowing they are responsible for Muni riders being hit and killed because they put cars first. I’d like to think that SFMTA planner Sean Kennedy doesn’t actually care more about parking that safety, but the evidence points to him being a heartless monster. Or maybe just a coward since he has all the evidence on his side, but caves when someone calls him a liar. Either way, what Taraval residents have demonstrated this week is with enough berating and verbal abuse then SFMTA staff caves in. I know you mean this as a joke, but since the SFMTA doesn’t enforce traffic laws on Sundays, a caring car owner could park right there, at the start of the frogger zone all day long so L-Taraval riders will be protected from traffic. In fact, why not park right there today and stop traffic from hitting pedestrians! You’re going to have to type a little bit more so we can follow the logic that “They have better transit than SF” means that “many us moved to SF because it is a VERY CAR friendly city”. If individual homeowners had paved over their front yards for parking then you would expect to see variance from one house to another. That is not the case for the 2/3 blocks I cited.. So it appears that if the sidewalks were indeed broadened at some point in time, it was the city that did it. My guess? Turk used to carry a lot of traffic when the old elevated 101 ran through Hayes Valley. When that was pulled down, Turk became much less used and, to this day, it’s one of the more pleasant E/W streets to travel on. Even after a bike lane and a bus route, it is one of the few streets in the city that is too wide for purpose, so why not give some back to the pedestrians, the local residents and for parking? Perhaps a better way to express it is that there are many parts of SF that are car-friendly, and that attracts people. Probably only the NE of the city is aggressively unfriendly to vehicles, with ChinaTown and North Beach perhaps the worst. Even then, Manhattan is far worse. But if you live in the southern or western parts of SF, which is what we are talking about here, I’d say SF is very car-friendly. For instance, apartment buildings in the older cities back east rarely have parking but the vast majority of SF homes do have parking. You’re suggesting that people choose to move to SF based on very nuanced information about SF that doesn’t apply to NYC/Boston/DC/Philly/Chicago? Do these people just know about how convenient it will be to live and work in the outer Richmond, but there’s no place like that in those other cities that they know about? If “car-friendly” is anywhere in the top 10 of someone’s list of things they want, they won’t get anywhere near SF. You compare SF to Manhattan to make your point, neglecting to note that pretty much everywhere else in the country is more car-friendly than SF. I cannot speak for the person who said that. But having lived in a few of those cities, and having visited and driven in the others, I’d say that SF is a fairly car-friendly place overall. Part of that is simply because it is a western city, and western cities developed after the auto was prevalent while east cost cities generally were not. And it depends where in SF you are, as noted. In my case I live close to the geographic center of SF and can drive most places in 20 minutes or less. Not bad. I can even usually park! And in particular, on the west-side, most people have a car-centric lifestyle, which needs to be understood if one wishes a context for issues like this one. We are talking about cities here. Obviously somewhere in the middle of Texas is more car-friendly than SF – that isn’t the point. But when I moved from the east coast (Boston, Philly, NYC) to SF I found my new home to be more car-friendly, so I imagine that many people are accepting of that. SFMTA will always be SFMTA, a history of watering down and weakening solid improvements, I wasn’t surprised that it would come down to this. What is more concerning is the piloting of these absurd and ridiculous hash marks which will do almost nothing to enhance the safety of passengers getting on and off at stops on Taraval. To me these hash marks are nothing but USELESS paint and WASTED space, might as well put in the boarding islands anyways to begin with. I will agree that it is unnecessary to install a barrage of traffic lights because it isn’t needed to speed up the service and that the low traffic loads for those intersections doesn’t justify it. Bottomline to simply put, move forward with the red painted lanes and install the boarding islands, those are very easy to do steps that will speed up service and improve safety. I don’t care if that means taking a few parking spaces away, those who drive can find somewhere else to park nearby.